You no longer need to track your investments using notebooks or spreadsheets and manually calculate your investment holdings! 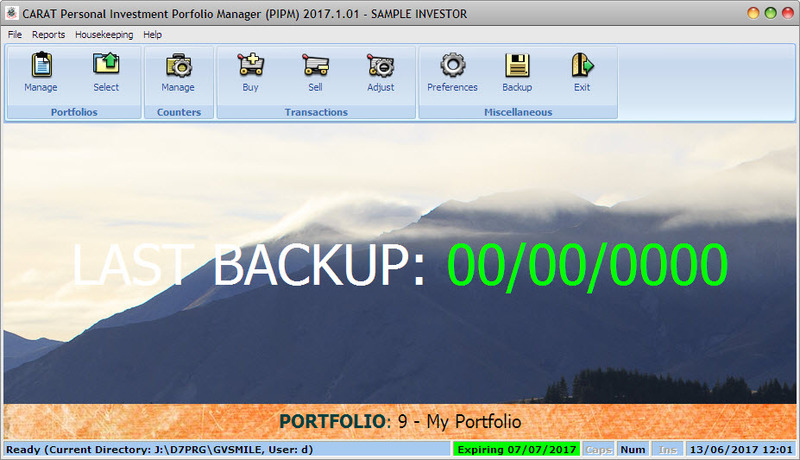 Gather all your investment transactions and keep them using our new personal investment portfolio manager software. CARAT PIPM will track historically, your Buy and Sell quantities, value for multiple counters and for multiple portfolios and will generate reports on your Buy dates and range, Sell dates and range, Average Buy and Sell prices, profit/loss upon sale and accumulated profit and loss by counter and total holdings. There are three ways to sort the reports and includes one that you can customise the sort order to your style. The reports will have details as well as summaries and they will be calculated in real time. You can print to the screen, save to PDF, print to the printer and even export to Excel. You can set multiple currency investments. Upon a Sell, you can set off against the Buy date. You are in control. There is no time limit on how long you want to maintain the historical data, you decide. Download a free evaluation of CARAT PIPM today and try it for yourself. If you are into serious investing, purchase it now and put a SMILE into your investment portfolio and assist your decision making.